Its an exciting new year at the University of Colorado as the Colorado Buffaloes enter their inaugural season in the PAC 12 conference. The Buffalo's tough football sports schedule begins against Hawaii on September 3rd, 2011. The Buffs inaugural season will be lead by first-year Coach Jon Embree, and his new Offensive Coordinator Eric Bieniemy. These guys are both former students of CU and dedicated Colorado Buffaloes, so the program will be exciting to watch unfold. 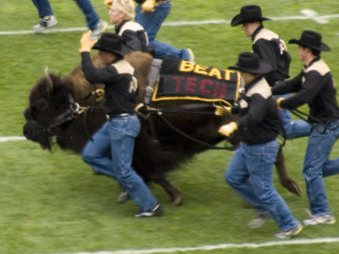 The PAC 12 is expected to be tough, but CU has faced Nebraska, Oklahoma, and Texas for decades and knows what tough is all about. Come support the team this year and cheer on the Buffs. Check out the seat availability and ticket specials. This is a photo from my son's campus dorm room overlooking the surrounding foothills at CU in Boulder. before shopping for a Denver Area home!